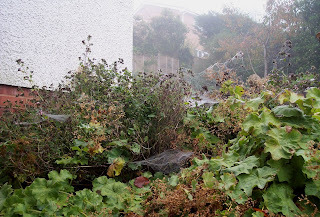 In some ways October has turned out to be just as I thought, in other ways - not. I thought I would have hardly any time to read but that was nonsense. I generally average six books a month and that's exactly the number I've read this month too. I also thought I would be very busy and that has turned out to be correct. We got back from a nice relaxing time in Cornwall on Saturday (yes, I have photos to share but they'll have to wait until next week) and I don't seem to have stopped running around since - our next visitors, my eldest daughter and her family, arrive for three days on Friday. 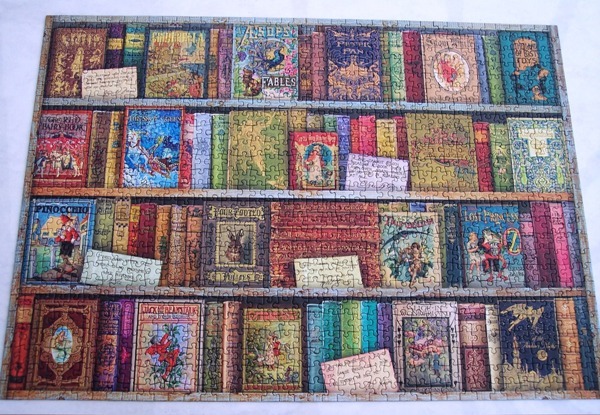 After that I can collapse... hopefully with a good pile of books! I have three books I haven't reviewed so I'm going to do quick ones of each in order to get caught up *again*. First up, The Various Haunts of Men by Susan Hill. In the small cathedral city of Lafferton a woman has gone missing. Her employer tells police that this is out of character but nothing much is done except that a young police officer, Freya Graffham, new to the area, takes the case on in her spare time. She senses this is a serious case and is proved right when others start to go missing, even a dog. The common denominator in each case turns out to 'the hill' an area used by all kinds of people - walkers, runners, dog owners etc. Freya and Chief Inspector Simon Serailler set about finding out what is going on in their beautiful old city. The thing I liked about this book was how involved I got with the characters. It's quite a long book and Susan Hill uses that length to give a lot of background information on not only the main police characters but also the victims of the crimes. You feel as though you know them and thus the shock when various of them die is quite profound. Interspersed with the normal narrative are short chapters written in the first person by the killer. This added to the suspense and although I did guess who the culprit was quite early on, it in no way ruined my enjoyment. I found the book atmospheric, well written, and even creepy in places and thought it a superb beginning to the Simon Serailler crime series; I already have the second one on my library pile. Next, The Extraordinary and Unusual Adventures of Horatio Lyle. The scene is London, 1864. Horatio Lyle is a scientist, inventor and special police constable. He's called on by the government to recover a Chinese plate that has gone missing - an embarrassment to one and all. 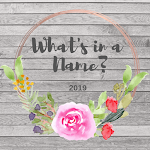 Aided and abetted by Tess, a street urchin and thief, and Thomas, heir to Lord Elwick, Lyle sets about finding the plate which appears to have rather strange characteristics. The problem is, two other sets of people are also desperate to find it: a group of Chinese who, it seems, will stop at nothing and some strange individuals with hypnotic green eyes who might not even be human. Will Lyle succeed in his mission? I read this YA book while away on holiday and as such it fitted the bill of being a light, humorous read. The author, Catherine Webb, wrote her first book at 14 and this is her fifth, written when she was 20 in 2006. Two more books about Horatio Lyle have already been written. I find this impressive and the young lady obviously has quite a future ahead of her. I would say the books are very much aimed at young adults and perhaps lack a certain depth that you might find in books for older people. But that's fine and I rather enjoyed this easy, undemanding, holiday read. No pic of Miss Mapp by E.F. Benson as the copy I've just finished is an ancient old library book. Devon library services only had one copy in the whole of Devon - that was in Exeter and the library assitant had to go down into the bowels of the building to get it for me. What a shame that *apparently* no one is much interested in these delightful Mapp and Lucia books any more. Anyway, this is book two in the series set, and written, in the 1920s. The first was about 'Lucia', living in the village of Riseholme and in this one we meet 'Miss Mapp', living in the village of Tilling. Miss Mapp is a busy-body. She keeps an eye on the comings and goings in the village from the window of her garden room. She also interferes in the lives of her friends, none of whom are very much better than her to be frank. All live off gossip and speculation and this is basically what the book is all about... the day to day happenings, relationships and petty feuds with friends and neighbours. Delightful. Benson was clearly a very good observer of the foibles of his fellow human beings - these people are very real, good hearted some of them, but often with selfish motives. Issues such as food hoarding before the coal strike, drinking to excess, and how to clothe oneself when money was short are dealt with in a sympathetic and humorous way. I think I have one more book to read, Lucia in London, and then the two finally meet. Can't wait. I'm away for a week from tomorrow but before I toodle off I thought I'd share a few photos. 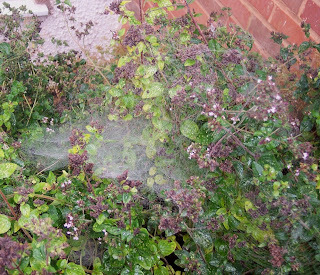 Autumn is my favourite time of year and part of that is because you get such good cobwebs. 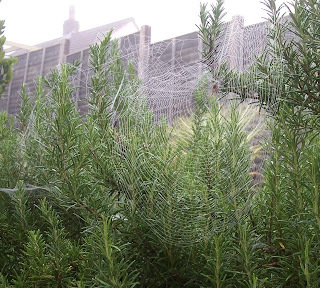 We had an excellent fog one morning last week so I popped out into the garden to get a few shots. 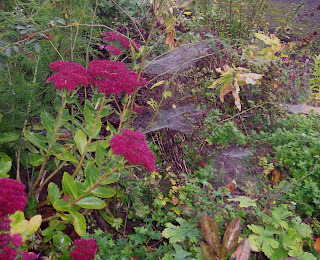 These photos are not fantastic but I had fun finding the webs. Click on the pic for a much larger view. 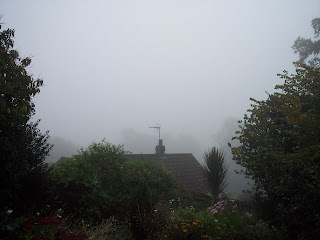 I tried to find a normal shot of the view from our house but this was the most normal I could find. 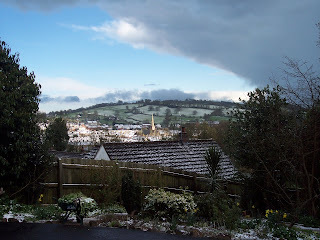 The late sprinkling of snow in April of this year. Hopefully my home county of Cornwall will provide a few decent photos next week. First up it's another creepy read for Carl'sRIP III challenge - Tunnels by Roderick Gordon and Brian Williams. Fourteen year old Will Burrows lives in London with his family. They're a strange lot - his father digs underground tunnels for a hobby, his mother never shifts from in front of the TV and his twelve year old sister is rather emotionless but is the one that keeps the household running. Will is a tunnel digger too and introduces his one friend, Chester, to his underground world. But there are some odd looking people wandering about and possibly following them. Why? When Will's father suddenly goes missing Will discovers that he was digging a tunnel he hadn't told his son about and it descends from their cellar. Chester is coerced into accompanying him on the adventure into the subterranean depths to find Will's father. What they find there will change everything Will has ever known about himself, his family, and even the history of the human race. This pacey, imaginative story for young adults really pandered to my love of books that go underground. (The Hollow Kingdom series by Clare B. Dunkle did likewise.) I found it gripping and really quite scary in a 'what if?' sort of way. The race of beings that Will and Chester go up against are not pleasant in any way, shape, or form and full marks to the authors of this book for creating a universe that is both believable and at the same time not remotely cosy. In short, I loved this book and would especially recommend it for teenage boys or anyone like me with a love of underground stories. The sequel, Deeper, is already available and I'll be searching that out as soon as I can. Next it's Mister Pip by Lloyd Jones, a book that won the 2007 Commonwealth Writer's Prize and was also shortlisted for the 2007 Man Booker prize, so I read it for my Book Awards Challenge that's being hosted by 1more chapter.com. Matilda is a young girl living with her mother in a small village on a tropical island. Her father left the island some years ago, to work elsewhere, he sends money home occasionally but basically he is out of their lives at the moment. A civil war is looming on their island involving a big company and the young men of the island. Suddenly the war starts and the island is cut off from the rest of the world. Life becomes a question of survival for the village. Mr. Watts, the only white person on the island, takes on the task of teaching the children using a copy of Great Expectations by Charles Dickens. The book rapidly becomes one of the most important things in Matilda's life, even though the place and time it was set is a million miles from her experience. Unfortunately, the book also plays its part in later misunderstandings with soldiers from both sides of the war, with completely unforeseen results. It's hard to describe my feelings about this book because they're mixed. To say I *enjoyed* it would be wrong. I did enjoy a lot of it, the teaching with the book, the bits about the islanders lives etc. But some - much smaller - parts of the story are quite brutal, to be honest, and rather hard to take. I'm glad I read it, I like to read stuff like this from time to time to give myself a good dose of the reality of some people's existences. And the quality of the writing makes the book worth reading too. It also reminded me that I would like to read Great Expectations again sometime soon - I last read it in my teens and am almost positive I would get a lot more out of it now I'm older. There! I'm up to date with reviews at last. I'm halfway through The Various Haunts of Men by Susan Hill, which is fantastic, but I'm pretty certain I won't manage to finish it before Saturday, so that review will be for when I get home the week after next. I think Twilight by Stephenie Meyer is probably one of the most famous books around at the moment. Almost on a par with Harry Potter - everyone I know seems to have read one or two in the series and usually all of them. My visitor from Memphis is with me now and what's she reading? The third book in the series, Eclipse. So of course I had to see what all the fuss was about and happily added it to my pool of books for Carl's RIP III challenge. For reasons not stated at the beginning of the story Bella Swan has decided to leave her home in Phoenix, Arizona, where she lives with her mother, to go and live with her father in Forks, in Washington state. It's awkward at first, her father Charlie is pleased to have her there but Bella has always disliked Forks and is not at all sure she'll be able to settle. He's bought a truck for her from an Indian friend, so at least she has transport, and with that she starts at her new school. Bella doesn't consider herslf to be a particularly 'cool' kid, or particularly pretty but is surprsied to find herself the object of attention of a couple of boys. She's never had many friends but finds that here in Forks she does actually have some, they may not be the cool kids, but that's fine. One day in the canteen she notices a group of teenagers sitting apart from the rest of the school. This is the Cullen family and it's explained to her that they are different and always keep themselves aloof from everyone else. Amongst the Cullens is Edward, absolutely the most gorgeous boy Bella has ever seen and it's not long before Bella realises that he has noticed her. After a shakey start they begin to communicate. Then Edward saves her from certain death under a runaway truck and Bella can't figure out how he got there fast enough to save her. Something is definitely peculiar about Edward. Bella sets out to find out what it is exactly and it's not long before she realises she has fallen in love with a vampire. Most people, I have to say, seem to love this series. Those that don't seem not to like the fact that mostly it's just a teenage romance book with vampires. And this is true, it is. Three quarters of the book is about how Edward and Bella get together, their life at school, and not a lot else. I'm trying to work out why that didn't bother me and I can't. Yes, I liked the two main characters, I also liked the forrested setting of Forks, WA. Most of the book really isn't *about* very much to be honest but despite that I really did like it an awful lot. And when it suddenly took off, a hundred pages from the end, with the arrival of a rogue group of vampires, it was suddenly unputdownable! Superb. If I was going to be really nit-picky I would say that sometimes Edward's resemblance to a Mills and Boon (Harlequin in the US) hero did grate a tiny bit. He is ever so slightly *too* perfect. But I can live with that quite happily, although I probably won't be handing it over to my husband to read. He reads Kelley Armstrong but I'm thinking Stephenie Meyer might not be for him. I have the next book, New Moon and will read it probably next month when I can devote more time to it. This is my fifth book for Carl's challenge so I'll list it as an extra book or something as I've already read my four books for Peril the First. I'm going through one of those busy periods at the moment - my husband had a knee operation the week before last so that's involved a lot of coming and going, next week I have a friend from Memphis coming to stay for 10 days so of course that means lots of housework and careful planning, and after that we're off on holiday to Cornwall for a week. So basically October is going to be something of a washout as far as reading is concerned; it'll probably come down to reading in bed for ten minutes last thing at night. The book I'm talking about here, The Moor by Laurie R. King, took me ten days to read and that's no reflection on the book - it was an excellent read. It is in fact the fourth and final book for my Peril the First challenge for Carl's RIP III Halloween challenge. This the fourth book in the celebrated Mary Russell/Sherlock Holmes series. It begins with Mary, busy with her studies at Oxford, receiving a telegram from Sherlock Holmes. He's on Dartmoor, staying with a friend, The Rev. Sabine Baring-Gould. 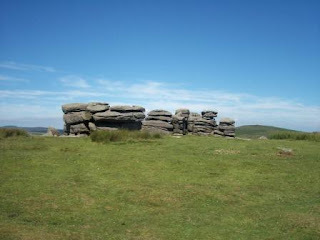 He needs Mary's help but doesn't say why and, albiet reluctantly, Mary hotfoots it down to Dartmoor immediately. She arrives in the middle of nowhere, isn't met, and has to walk the two miles, at night, in the pouring rain, through muddy lanes. She arrives wet, muddy and dishevelled and isn't best pleased at the rather snotty reaction she gets from the men of the house. Worse still the house is freezing and the food appalling: Mary is more than a little bit inclined to return to Oxford the next day. Instead she allows Holmes to tell her about a strange death that has occurred on the moor and about a ghostly coach accompanied by a large black dog that has apparently been seen in several parts of the moor. 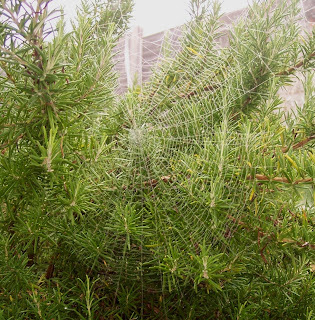 Russell and Holmes set out to travel the moor, gathering as much information as they can about the dead man and the apparitions people have seen. Baskerville Hall, the scene of one of Holmes's most famous cases, has new residents, Americans, Richard Ketteridge and his secretary, David Scheiman. Holmes and Russell get to know them and then suddenly the mystery deepens when a man is found dead - floating upside down in a quarry pool. Can The Moor be persuaded to reveal some of its secrets to the two sleuths? I think this is probably my favoutite Holmes/Russell mystery so far. 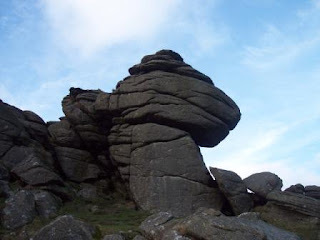 I live not far from Dartmoor and visit occasionally, so some of the locations were quite familiar to me. That could explain why I like this one so much but I think too the air of mystery and suspense is quite strong. 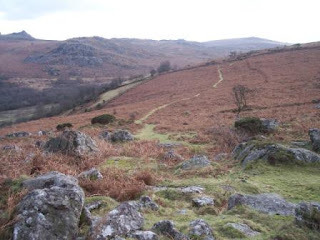 But really, I think it is all down to Dartmoor itself. 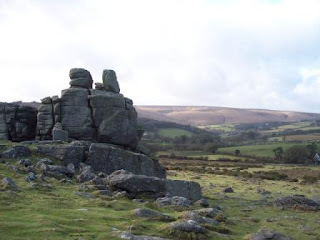 The author describes the wildness of Dartmoor very vividly, it's as though the moor is an important character in its own right, so strong is the atmosphere of wild but slightly menacing beauty. I've fished out a few photos I've taken in the past which I thought would go quite nicely with this post. 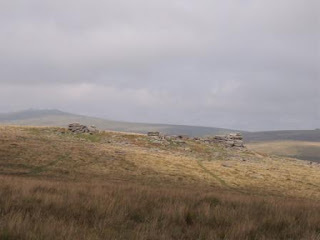 Two general views first, illustrating quite well the wildness of Dartmoor. 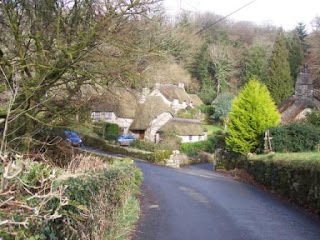 The softer face of Dartmoor - this is the village of Buckland-in-the-moor. 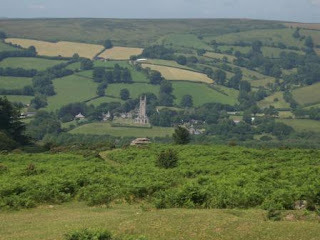 And this is Widecombe-in-the-moor of Uncle Tom Cobbley fame. Anyway, an excellent read. Officially my challenge is finished I suppose but I intend to continue with the books on my list as there are several I still really want to read - depending on time of course.